Summer Guest Blogger Friday! It's Jennifer from Notes From the Burrow! My mom died on August 4, 1990. It's a painful day for me to get through. I don't know why it is so hard because I think about her on all the other 364 days of the year too. It's not really any different. It just feels different. I have a good friend who has commemorated her death in some way every year since our friendship started. One year she gave me a lilac bush which is thriving in our yard. She usually gives me flowers. It is very sweet. I have known this friend for only about 8 years which isn't terribly long but she's the kind of friend where it feels like we've been friends forever. I knew I wanted to be her friend when we were rehearsing a skit for our church group in which about ten women sang "I Feel Pretty," in shower caps and bathrobes. She and I laughed and laughed about it. It was really funny. I knew I wanted to be her best friend when we went to see "Anchorman" together and my head almost burst from the pain of laughing so hard with her. She and I almost share the same brain. We say the same things. We think the same way. We laugh at the same stuff. Sometimes we think we were separated at birth because we are so much alike. Our friendship struggled several years ago. We had some issues and some fights. I had never fought with a girlfriend except one other time in high school when I yelled at Marybeth Bauer to stop acting like my mom. I don't know how to fight...I don't like conflict especially when I can't see how there can possibly be a comfortable resolution. So I run. I ran from this friend. I sent her an email the day before her 30th birthday...a week before August 4th. An email that said I couldn't be her friend right now but maybe someday in the future we could be friends again. Goodbye. And then I cried. She was such an important part of my life and I cut her out just like that. She still sent me flowers on that August 4th. She remembered that it's the hardest day for me. And then life started to go on. I would think about her all the time and wonder how she was and if she made new friends. I looked for her everywhere...the spray park, Kroger, Target, Maya's. She was never there. I had a new baby and hoped and prayed that she would walk through the hospital door with a hug for me and my new little one. I dreamt about her all the time. I would wake up so disappointed because we weren't friends in my real life. August 4th approached again. The hardest day for me of the year. And in the afternoon, the doorbell rang. It was the flowers from my friend. She signed the wrong name on the card because she wasn't sure I would want flowers from her but I knew the handwriting. 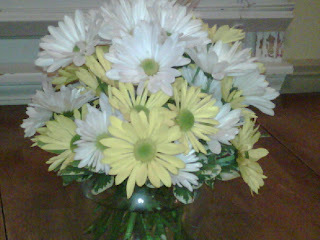 The flowers were yellow because she knows it's my favorite color. My heart was bursting with sadness at missing my mom and yet this gesture from this friend at this moment had a great healing effect. The pain I felt was diminished that day. I went to my computer almost immediately and sent her an email thanking her for the flowers and telling her how much I missed her. She sent one back and pretty much said the same things. She missed me too! She didn't hate me. I had been afraid that she did. We continued to email for a few weeks and finally I got some courage. I dressed Lizzie in the outfit that my friend had given her before she was born and we headed to her house. I pulled in the driveway and my hands were shaking and my heart was pounding. I rang her bell and I heard her voice say, "Who is it?" I heard her son say, "It's Jennifer." I saw her come down the stairs and I could not contain the tears. She opened the door and opened her arms and I fell into them whispering, "I'm sorry, I'm sorry." I cried and then we sat on her porch and talked for a bit. She had to leave to go somewhere, but in those few moments we were together again, I knew it was going to be ok. I knew our friendship could be repaired and ultimately overcome our year of silence. It took some time to iron out the issues that had led to me withdrawing my friendship. We worked through it and I am happy to say that she is my best friend again. This year on August 4th, she gave me flowers. Yellow and white. She remembers that day and how painful it is for me. This year on August 4th, I gave her flowers. I remember her gift of flowers a year ago that were the catalyst for bringing her back to me. It is our friendship anniversary of sorts. I love that I have something joyful now to share on that day. A truly beautiful story, thank you so much for sharing it with all of us! Jen, I know I told you this before, but I loved this story. It's so amazing to have friends like that and I'm happy it's now a good memory day for you. Thanks again for guest posting! Touching story! And how wonderful that a day of sadness for you has some different meaning to celebrate.